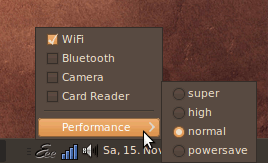 eee-control is a simple and easy to use application to control computer hardware under ubuntu 10.04 or other linux based operating system.Eee-control can easily switch(Bluetooth,WiFi,..etc) on and off and allows you to configure hardware hot-keys,high power-saving mode in few clicks.Other important features includes performance control(By adjusting FSB and CPU voltages) for saving power or over-clocking,Hardware sensors(Temperature,Fan) can be easily monitored,notifications,better fan control. 1. First Download the Debian Package(*.deb) from the link given below. 2. Open it with Gdebi Package Installer by Right clicking on the saved file and then select Open with Gdebi Package Manager(OR just double click on the file OR after clicking on the above download link,choose the option that says -open with Gdebi package installer). 3. Then click on Install Package(Then you may have to enter your login password to proceed) and wait until the installation would complete(It won’t take more than a minute). 4. That’s All… You have installed eee-control successfully on your ubuntu computer. You can open eee-control from Applications->System Tools->Eee Control.Then configure the Eee-control settings as you want.